Minneapolis – ABDO (abdopublishing.com) introduces Abdo Zoom STEAM, a unique new installment to the leading educational publisher’s online database offering through its PreK-2 research feature. 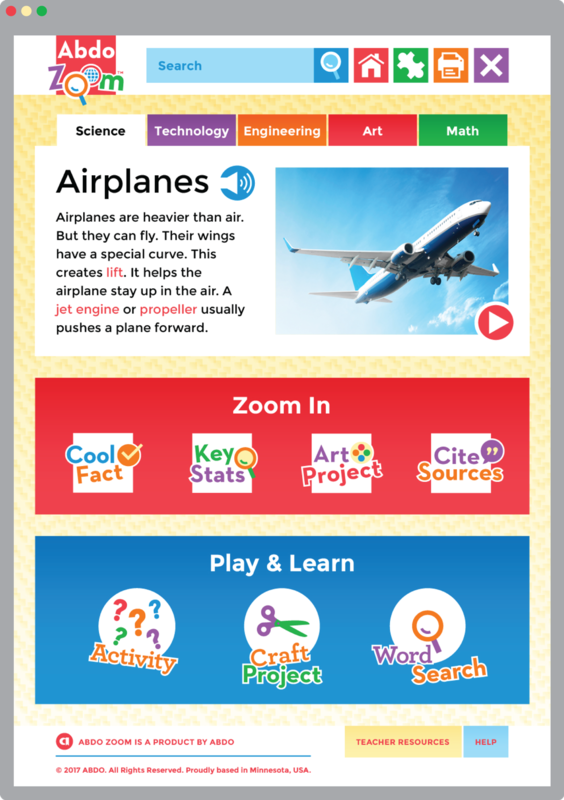 Abdo Zoom STEAM includes more than 100 content pages, each integrating all five components of STEAM education – science, technology, engineering, arts, and math. An added feature in this database is a downloadable art project or activity for each topic. The STEAM database is the fourth of several Abdo Zoom databases that allow young readers to practice online research in a safe, secure environment. Features include read-aloud text, highlighted glossary terms, streaming videos, and printable activities and games. The puzzles, crafts, games, and coloring activities reinforce learned vocabulary and concepts through a disguised learning approach. The Abdo Zoom STEAM database is available for purchase directly through the ABDO website or through a local ABDO representative. ABDO offers multi-year and multi-database discounts on Abdo Zoom subscriptions.